I assume this bookplate to be from Texas historian Clarence R. Wharton's library. The book it's in is about the explorer LaSalle with chapters on his settlement and exploration on the Texas coast in the 16th century. So it's a safe bet to assume this CR Wharton is the Texas historian CR Wharton. 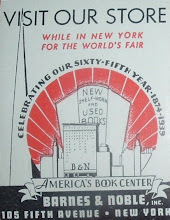 Kind of an odd bookplate, though, for Wharton. I would have thought something along the lines of a Spanish mission or anything more ornate than a palm or cactus of some sort on what looks like a bare cul-de-sac lot. Perhaps it was from his front yard in Houston and he liked this particular tree. Who knows? It's symbolic of something I'm guessing. Something from Texas history or Lone Star State lore. WHARTON, CLARENCE RAY (1873-1941). Clarence Ray Wharton, lawyer and historian, son of Frank B. and Ella (Ray) Wharton, was born in Tarrant County, Texas, on October 5, 1873. He attended the common schools of the county and taught school from 1888 to 1892. He studied law, was admitted to the bar around 1893, and in 1895 practiced law in Decatur with Charles V. Terrell.qv Wharton moved to Richmond in 1897 and to Houston, where he entered the law firm of Baker, Botts, Baker, and Lovett (see BAKER AND BOTTS) in 1901. On August 5, 1902, Wharton married Adele Spoonts of Fort Worth. They had four children. Wharton was made a full partner of the law firm in 1906 and became a prominent corporate attorney in Houston. He was counsel for Houston Lighting and Power Company, Houston Gas and Fuel Company, and Houston Electric Company. An interest in Texas history prompted him to become a writer. In addition to many articles, his published works included The Republic of Texas (1922), El Presidente (1924), San Jacinto, the Sixteenth Decisive Battle (1930), History of Texas (1935), History of Fort Bend County (1939), Satanta, the Great Chief of the Kiowas and His People (1935), L'Archeveque (1941), and Gail Borden, Pioneer (1941). In 1930 he wrote and edited a five-volume Texas history, Texas Under Many Flags. Wharton was the first chairman of the Houston Community Chest and was prominent in the American Red Cross during World War I.qv He was an active member of the Harris County Historical Society, of which he was vice president in 1923. He was an Episcopalian. He died in Houston on May 1, 1941, and was buried there in Glenwood Cemetery. BIBLIOGRAPHY: Houston Chronicle, May 2, 1941. Vertical Files, Barker Texas History Center, University of Texas at Austin. At a book sale over the weekend, I found the following book and bought it for the interesting label above: The Jewish State 1896-1946, by Theodor Herzl, published by The Emergency Zionist Council, NY, 1946. The title page offers this subtitle: An attempt at a modern solution of the Jewish Question. And I offer that bit of information because it ties in with, or explains the presence of, the book label pasted on the front endpaper. Masada is an historic landmark in Israel where the last group of zealots from the Jewish Revolt against Rome, first century C.E., held out until they realized there was no escape from their fortress and committed mass suicide. Actually, it sounds more like murder-suicide because the men decided to kill their wives and children before allowing them to be captured, enslaved, and the women forced into prostitution. After they killed their families, they killed each other. A few women hid themselves to escape death and later related the story of what happened at Masada to Josephus Flavius. Josephus put it all in writing In an ironic twist, that desperate act of suicide in the face of defeat came to symbolize survival of the Jewish people. 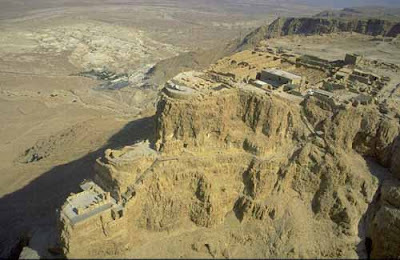 The photo of Masada above is from the Jewish Virtual Library. Also at that site, I found this on Theodor Herzl: He was the father of political Zionism and outlined his vision for a Jewish state in Der Judenstaat (The Jewish State), published in February 1896. So the symbolic significance of Masada and the Zionist movement to establish a Jewish state inspired the formation of an organization called MASADA, Young Zionists of America, which began publishing a series of books 50 years after Herzl's classic text came out. Appropriately, they started with a reprint of Herzl's famous book. And upon publication, they pasted these labels into the front of each book. It would interesting to find out how many books were published in the series, their titles, the publishing time-span, and how the labels may have changed, if they continued at all. I can't find much on the history of this series and have to assume that it was discontinued a number of years ago. And the bit of bibliophemra pasted in the book is a paper relic, with a rich historical reference, of a past organization that promoted Jewish culture and survival before the state of Israel was created. I found only one other title by the publisher The Emergency Zionist Council: The Facts About Palestine, by Arthur Lourie, a 17-page pamphlet published about 1946 or 47. The reference below is about all I can find on the organization that produced the book label for the reprint of the Herzl title, first in the proposed series. Perhaps the series plan died after the Herzl book. Purpose: To establish Palestine as the Jewish Commonwealth; to participate actively in Jewish community life in the United States. Publications: Masada News; Masada Bulletin. 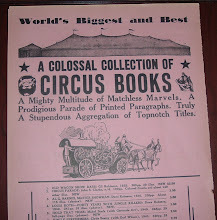 Frederick W. Skiff (1867-1947), of Portland, Oregon, was a notable bibliophile and prolific collector of Americana. 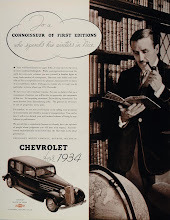 He also authored a few books: Adventures in Americana: Recollections of Forty Years Collecting Books, Furniture, China, Guns and Glass, Metropolitan Press, Portland, Oregon (1935) and Landmarks and Literature: An American Travelogue, also by Metropolitan Press (1937). 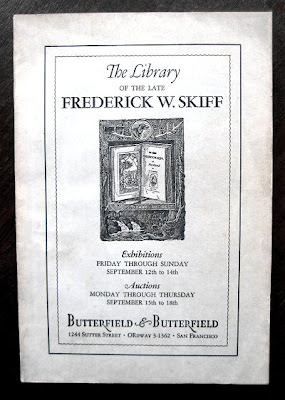 After Skiff died in 1947, his collection went to the San Francisco auction house of Butterfield & Butterfield, in San Francisco. 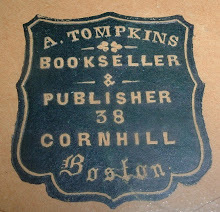 The auction catalog (left) featured Skiff's bookplate. To Frederick W. Skiff, Esq. with grateful appreciation of his most kind courtesy & the faithful regards of Lilian Whiting, Boston. Christmastide, 1916. I guess it will be impossible to know what, if any, meaning that passage held for Mr. Skiff. Perhaps it was just something Ms. Whiting came across, liked, and thought to amend to her inscription. Presented to me by Miss Whiting Christmas 1916 F.W.S. That line of penciled inscription and its location is the icing on the cake for me. William Fowler Hopson (1849-1935) was the Connecticut-born, American artist/engraver who created Skiff's ornate bookplate. 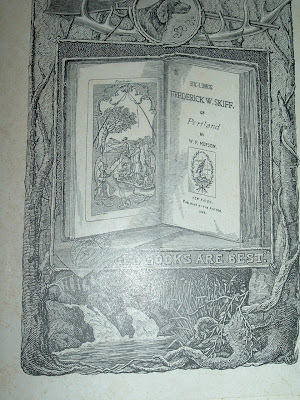 Hopson was a well-known and well-respected artist, drawn (pardon the pun) to bookplate illustration. In researching Hopson, I discovered Jose Vicente de Braganca's excellent blog, Ex Libris//Bookplates. It's a great site, very informative, well-written and nicely presented. He wrote about Hopson earlier this year in this entry. And if you've got a late 19th-century Webster's Unabridged Dictionary lying around, you might find between the covers a few thousand engravings by Hopson, who was commissioned to do the work. 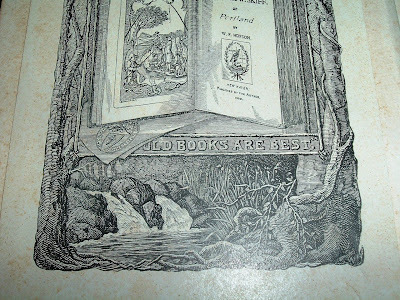 I'll close with some enlarged sections of Hopson's artwork for Frederick W. Skiff's bookplate. Who knows what valuable and collectible bookplates of the future lurk among this group?